12/10/2008 12/10/2008 by tom moody Comments Off on "Sad Alpha"
Written after seeing the Arthur Russell documentary. 12/10/2008 12/11/2008 by tom moody Comments Off on "Pitch Lesson"
Made a chart with all the pitches and their equivalent frequencies so I could teach myself EQ-ing (most equalizers use frequencies and was tired of looking at numbers that meant nothing to me). Then made a grid in Cubase with all the pitches between C-1 and B9, recorded it, and used various equalizers to see if I could selectively eliminate pitches. After that exercise, I cut up my pitch grid into loops, added a kick and ambient percussion, and the above tune resulted. 12/10/2008 12/10/2008 by tom moody Comments Off on "House Sweeps"
Full disclosure: this is one of those "art" pieces. An LFO-triggered filter sweep such as you might hear in a club tune, at the end of a dropout, right before kick comes triumphantly back in and takes the room to higher levels, here...fades out again. And then comes back... And then fades out, etc. 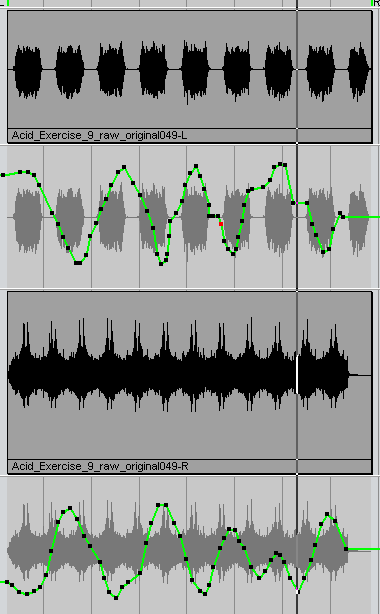 There is also a drum pattern being swept with an LFO on a slightly faster frequency. And panning as seen in the diagram (the green lines). The upshot is, it's repetitive, but nothing ever repeats the same way exactly. 12/10/2008 12/10/2008 by tom moody Comments Off on "Monomechanic"
So called because it is mechanical and mostly in mono. Made with the mutator filter, Electribe rhythm box, and some software drumming. Somewhat related, check out the Zom Zoms CD Lumbobo's Tube on Mutant Sounds. Great Devo/Residents-ish synth punk from Austin ca. 2003. Saw them in NY a few years ago, and, like, posted about them on my blog. Lumbobo's lacks the pop finesse of their later work; it's mostly slight Casio tunes and spoken/mumbled vocals with occasional jangly guitar or bass licks. But the whole is unpredictable, dissonant, and bracingly primitive.